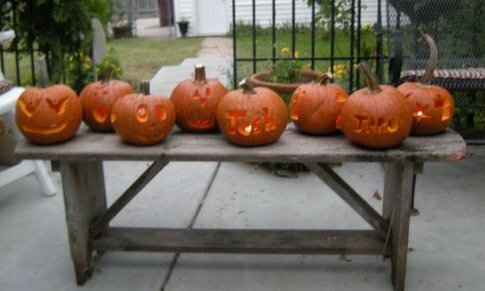 Nine kids: nine pumpkins. Grandpa and Grandma, with a pot of taco meat and fixings. After the dumb game where I make them interview each other and then introduce each other to the group, we get to work. Knives: Five boys around a table covered with newspaper. Two girls in the kitchen. Two more on the patio. Seeds. 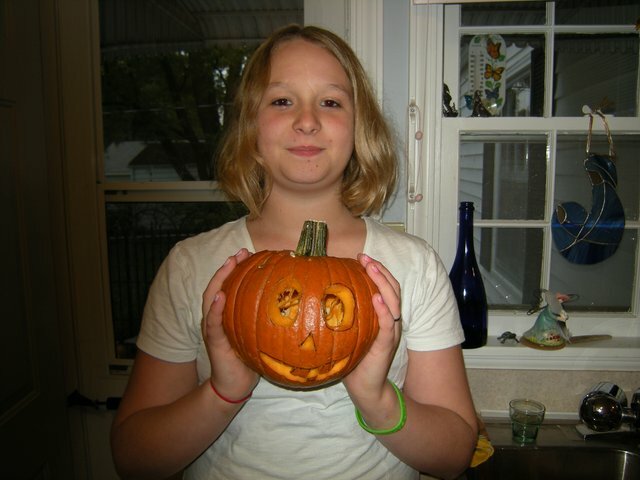 Lots of seeds and stringy pumpkin innards. Laughter. Then – that studied silence of creativity and focused concentration. 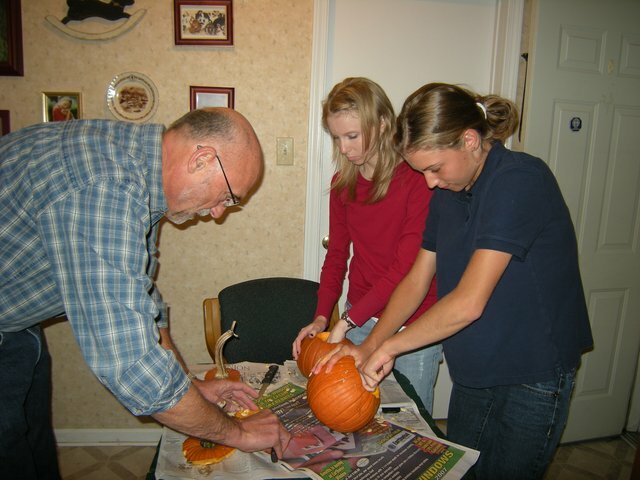 Grandpa helping with the finer points of carving. Grandma taking photos, hunting up a toothpick to save a broken piece, helping set up the food. Through it all – a barking puppy named Elijah, confined to his kennel in the kitchen, itching for a wild rumpus. We let him out and some of the kids take him for a walk. Supper: tacos, chips, salsa, apple slices in caramel dip. Mrs. Miller’s yummy bundt cake with black and orange sprinkles. No leftovers. What does Jesus mean when he tells us to deny ourselves and to die? We watch a Nooma video about how death is the engine for life. We think about how parts of ourselves can get in the way of our ability to love or to be compassionate. Like the part of ourselves that always has to be right, to look good, or to impress others. The video is pretty sophisticated for this age group. I wonder if it is making any sense. The kids are quiet and listening intently. Elijah keeps barking. I bring him in and try to calm him. He only gets worse. I take him back. Grandma, who is not all that keen on dogs, goes out to the kitchen, kneels down before his kennel, and entertains Elijah with a paper towel. 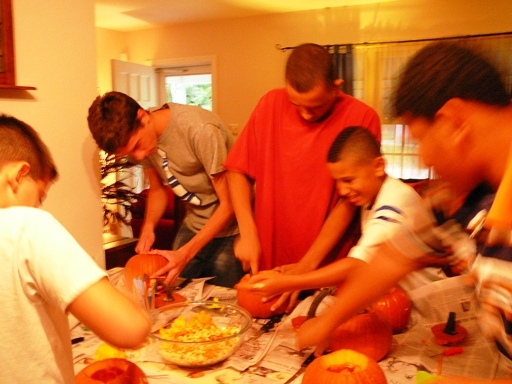 We go outside, light our pumpkins, and carry them home into the dark. I say I am too old for this. My youth group days are long over. I say I cannot devote the time and energy these kids deserve. I say we should be having lock-ins, going on mission trips, meeting more frequently. What I do seems so small. I teach them how to be still, silent, and prayerful. And I love them, wholly, and with a kind of wild desire for their highest good in God now and always. I go to bed deeply grateful for grace in the midst of chaos. I think about the kids in Chicago where knives are wielded for a completely different purpose. At church this Sunday we had celebrated Children’s Sabbath. Some of these youth shared information with the congregation about the horrible neglect and suffering of many children in our country. The kids I work with are deeply loved and cared for by large extended families and a whole church pretty much totally gaga about their every move. My heart aches, thinking of kids for whom a knife is only a weapon, for whom school is a crime scene, and a walk down the street an invitation for murder. What needs to die in us for our children to stop dying? As we were cleaning up Grandpa told me, “It is a miracle no one got cut!” Hmm, I think, no. Grandpa and Grandma, the miracle is that you are here. Special thanks to Bill and Sharon Smith, Eleanor Miller, Jean Schultz, Dave Strobel, “the pumpkin man,” everyone at Crestview UMC, and all of you who try to be present to children wherever they are. 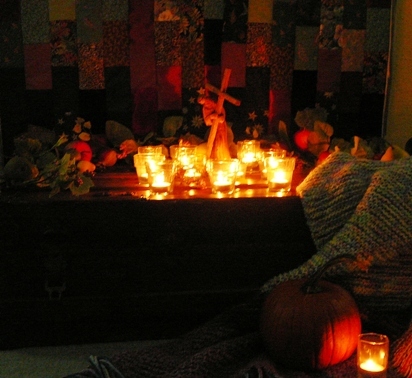 This entry was posted in faith, Prayer, Spiritual Practices, Youth and tagged carving pumpkins, children, children's sabbath, dying to self, silence, violence, youth group. Bookmark the permalink.